Two beautiful in-swingers by Mitchell Starc, and England were reduced to 0-2 in the first three balls. That's how the downfall of the Englishmen started who ended up losing by three wickets to the Australians today, at the SCG. It could have been much worse for the Three Lions, had Eoin Morgan, the captain, not played a brilliant knock of 121 which helped them reach a respectable total of 234. Coming in at 12-3, after Joe Root got out cheaply to Pat Cummins giving an easy catch to the first slip, Morgan fell short of partners. Morgan who was woefully out of form, led from the front. His innings included his trademark reverse sweeps against the spinners. His seventh ODI century, first as a captain, was studded with 3 sixes and 11 boundaries. Barring Morgan's contribution of a scintillating 121 only 93 was contributed by the rest of the team with Jos Buttler's 28 being the second highest score. Moeen Ali played some wonderful shots and looked good initially before he lofted a ball of Faulkner into the hands of Maxwell at deep cover when he was on 22. Mitchell Starc (4-48) having rattled the English top order already with the new ball, took two more wickets in the last over which included the all important wicket of Morgan and made the difference between what could have been a total of 255 plus. He will be on a hat-trick in his next match, likely against India on Sunday. Even Xavier Doherty, the left-arm spinner, chipped in with the wicket of Ravi Bopara and with the figures of 1-38 in 10 overs he was Australia's most economical bowler. James Faulkner too set it up for the Aussies with figures of 3-47. The part time spinner Glenn Maxwell leaked runs but claimed one wicket in the form of Chris Woakes. The dismal batting performance was followed by some inaccurate bowling by Steven Finn who even dropped Aaron Finch on 11 in the 6th over. Finch and Watson both did not last long and lost their wickets to Woakes and Jordan respectively. However, David Warner who is said to be tailor made for this format scored a brilliant 127 taking Aussies towards the victory. His purple patch continued as 18 boundaries came out of his willow and he scored his belligerent third ODI century. Chris Woakes was the only impressive bowler in that England card, with 4-40 in 8 overs. Stuart Broad, Steven Finn and Ravi Bopara went wicketless while Jordan and Moeen Ali picked up one wicket each. The hosts lost a flurry of wickets before chasing down the target in 39.5 overs which earned them a bonus point. All in all it was a win set up by the bowlers for the Kangaroo's. The decision of batting first by the England captain backfired. With an average total put up by the hosts they needed early inrodes, but their bowlers except Woakes did not deliver. The partenership of 79 runs between Smith and Warner cut short England's chances completely. This loss added to England's poor record in Australia of 11 defeats in 13 matches. With three more matches left before the WC, England seriously need to pull their socks up. Next in the series: Australia play India on 18th January on Sunday. 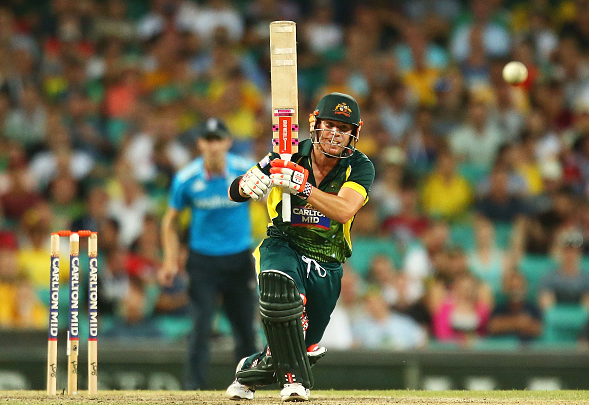 Australia nearly embarrass England in the opening game to the 2015 Carlton Mid-ODI Tri Series.